The procedures and techniques described here should be modified as necessary to conform to those set forth in the operating instructions for the particular helicopter being flown. During training, instrument takeoffs should not be attempted except when receiving instruction from an appropriately certificated, proficient flight instructor pilot. Adjust the miniature aircraft in the attitude indicator, as appropriate, for the aircraft being flown. After the helicopter is aligned with the runway or takeoff pad, to prevent forward movement of a helicopter equipped with a wheel-type landing gear, set the parking brakes or apply the toe brakes. If the parking brake is used, it must be unlocked after the takeoff has been completed. Apply sufficient friction to the collective pitch control to minimize overcontrolling and to prevent creeping. Excessive friction should be avoided since it limits collective pitch movement. After checking all instruments for proper indications, start the takeoff by applying collective pitch and a predetermined power setting. Add power smoothly and steadily to gain airspeed and altitude simultaneously and to prevent settling to the ground. As power is applied and the helicopter becomes airborne, use the antitorque pedals initially to maintain the desired heading. At the same time, apply forward cyclic to begin accelerating to climbing airspeed. 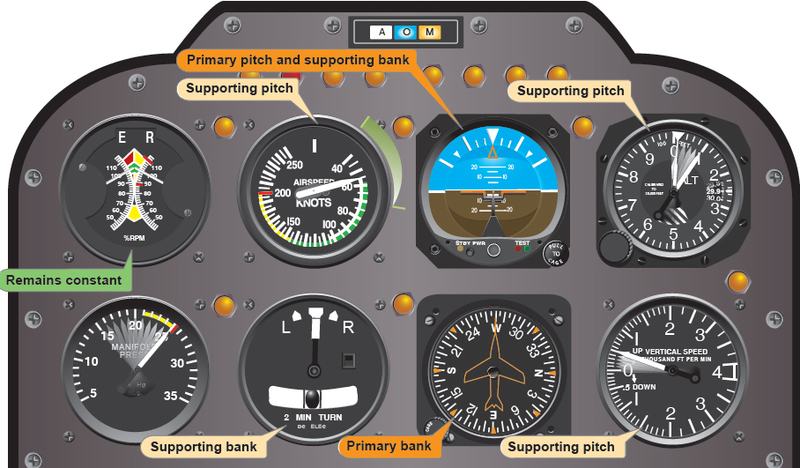 During the initial acceleration, the pitch attitude of the helicopter, as read on the attitude indicator, should be one- to two-bar widths low. The primary and supporting instruments after becoming airborne are illustrated in Figure 8-16. As the airspeed increases to the appropriate climb airspeed, adjust pitch gradually to climb attitude. As climb airspeed is reached, reduce power to the climb power setting and transition to a fully coordinated straight climb. During the initial climb out, minor heading corrections should be made with pedals only until sufficient airspeed is attained to transition to fully coordinated flight. Throughout the instrument takeoff, instrument cross-check and interpretations must be rapid and accurate and aircraft control positive and smooth.